Four red dragonflies, circling the tempting pool this morning. Our mind is like a pool. At times, they bear recurring patterns. Most times, they are in a state of their own. Every time, they are mine. Each, a landscape of my mind. is karen going to die? I was shocked when walter sent me a DM 2 weeks ago, sharing the news that Karen has cancer. She would be the first friend i know to have it. Today is her 25th day fighting cancer. On the 1st day of discovery, a big part of her liver has been attacked. The doctor gave her 6 months to live. On the 19th day, a biopsy report showed the cancer is spread from her colon upwards to her liver. Immediate chemotherapy and surgery is advised. She has come open with her cancer. Posting out to friends on her fight and educating us on almost a daily account on her Facebook account. I salute her calmness and collectedness facade, underneath I am sure she has her worries and doubts. Her husband and her 2 beautiful kids. Advice come pouring in and she is in a deadlock with no answers. The clock is ticking. I grow up understanding that cancer does not discriminate. To date, she has taken many of my relatives away and spared an aunty. At 9 years old, I barely knew how deadly cancer was. My first aunty found a lump on my late little cousin, Siew Luan’s thigh. Siew Luan was a fighter, she consoled her mom to be grateful that she only needed to amputate the bad leg. She was happy limping and playing hide and seek with us. She was grateful to be alive. But not for long. soon there were more tumours spreading all over her body. She was blinded when those cancer went up her head. My third uncle died having throat cancer and 40 years later his daughter, my cousin sister died of womb cancer. My little nephew died after a kidney transplant and a cousin’s husband passed away last year, 3 month’s after discovering he had throat cancer. He had been smoking for 30 years. My third aunty was diagnosed with cervical cancer and she survived 19 years on. Many fought and few survived. I pray she is as lucky as my aunty. God bless. It is night like this that haunts me. I’d be troubled by how swiftly my precious time ticks away, like an hourglass, barely able to trap a minute. Soon the minutes disappeared, the hours gone. My thoughts remain the same. Sadly, this poem was inspired on the day my daughter shared difficult emotions in her adult world. The why’s and what’s. As her mom, this modern que sera sera song i sang to her. Hubby bought me many books and I haven’t gotten into an adrenaline mood to scour them for the longest time. He so laughed at me whenever he teased me about my favourite authors, the likes of Paulo Coelho, Jeffery Archer etc. Marrying Stevie, transported my literary world into a new shift. I have been introduced to writers that I have known afar but fairly acquainted in any exchange of words. The first book he bought me was Catcher In The Rye by J D Salinger, and he hasn’t stopped at that. Since I am bedridden with a bad bout of body ache and phlegm; a dirty chance of an infection that leads to a bad flu. I didn’t want to over stress my body, reducing my body’s resistance, I relented when my doctor suggested I take leave from office. This brightly coloured cover invited me to pick her up. 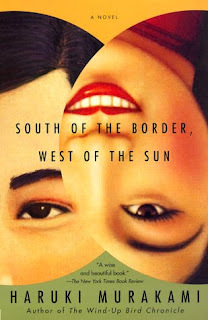 A Haruki Murakami book, entitled “South Of the Border, West of the Sun“. This would be my second Murakami book. Funny of all his titles, I actually started out with ” What I Talked About When I Talked About Running” . Odd that I was not introduced to his earlier writings and some of his more reputable works. I have been told, he is a great writer and every book is an encounter by it’s own. I can relate completely with the story. Highly introspective. I can see each character, sometimes as myself and many times the people who surrounded my intimate life. I comprehend the emotions of each character and to me, this is a believable story though fiction. I see no point in me narrating such a well written piece. It is short and easy read, so hard to put it down as Murakami, the storyteller succeeded to coax me to finish this 250 odd pages in a single day. I cried a tear or two. No kidding. I am such a romantic. In summary, the book enlighten me that all of us have memories. We just have to move forward in lives and be guided or haunted by them. How we deal with each relationship has to do with timing and the big word destiny. You are currently viewing the archives for March, 2011 at Lenscape Of My Mind.